A few weeks ago I had lunch with Tom Berghan, Lean Manager at Genie Industries. He is an avid student of the Toyota Production System and is always good for practical insights into ground-level Lean implementation. Tom observed that as American manufacturers are outsourcing, Toyota is keeping work in-house. When the world is flattening their org charts, Toyota is adding layers of supervision. Toyota is running contrary to several of today’s popular trends in manufacturing, yet they are very successful. Sitting in an airport lounge in Amsterdam, I spotted the article “Flatter is Not Necessarily Fitter” in the Financial Times, August 21, 2005 issue. This article talked about Tom’s point, that Toyota is very hierarchical yet successful, seeming to disprove the “the flatter the better” idea of modern organizational theory. After briefly comparing the effectiveness of Chinese-type family businesses, the success of GE with cutting out levels of middle-management, Honda’s ability to form and reform teams effectively within a hierarchy, and Toyota the FT article concluded that it’s more important to align the organization structure with the company strategy than to worry about whether it’s flat enough. While this is certainly true, I wonder if it doesn’t miss the point. It’s not the visible organization structure that matters, it’s the function of the positions within the organizational hierarchy and how they control or support those under them that matters. In a factory when you have work that is flowing one at a time paced to takt time, and workers are empowered to stop the line whenever they spot a problem, you need supervision and team leaders at 1:5 or 1:6 ratios so that immediate response and corrective action can be taken. These supervisors also need management support for problems that are outside of their scope of influence. If managers have to field problems from 10 supervisors, there痴 no way to cope. Again, Toyota has found the ratio to be closer to 1:5. 1. A large electronics manufacturers had over 100 workers per supervisor. The factory scoreboard looked good on the indirect labor measurement, and direct labor was low, but the assembly area looked like a mess. There was no ability of the supervisors to check quality, train the workers, or make daily improvements. This was reflected in quality, inventory, and on-time metrics on the factory scoreboard. 2. How much training are these supervisors given in problem solving, teamwork, and leadership? An embarrassed admission of “None” is the most common answer. 3. Every company that has come to us asking for help in fixing their broken or stalled Lean implementation has had either a lack of training for supervisors or too many workers per supervisor. Strong supervision is the key to sustaining long-term kaizen. 5. In one extreme case the supervisors at large transportation equipment company complained that by the time they finished the last performance review, it was time to start all over again with the first employee on the list. This would be as funny as a Charlie Chaplin move it if wasn’t so tragic. Solutions to challenges like these have included cutting out as much paperwork as possible, using as much visual management as possible to make communication easier, and training more team leaders to support the supervisors’ large span of workers. Shockingly, this can mean adding more layers of supervision and management. Many companies are reluctant to commit full-time people to Lean implementation until they see both the results and how critical it is to have people full-time supporting these efforts. They are even more reluctant to add supervisors and team leaders in order to break up work groups of 15 to 25 into groups of 5 to 7. Often these supervisors can be “working leaders” who may be 25% to 75% direct and perform the training and improvement functions the rest of the time. Even then adding this indirect labor is difficult. It’s simply beyond the ability of most people in roles of supervision or management to respond effectively to daily problems that occur within a span of 15 to 25 workers, without delay. Since most modern organizations are “flatter”, the resulting delay causes a lack of flow, local optimization, batch & queue scheduling and execution of work, leading to later discovery of problems, bigger fires, more fire-fighting… the typical cycle of business as usual for traditional manufacturing or office environments. One question that is consistently asked to the executives of host companies by participants on the Japan Kaikaku Experience, our Lean study mission, is the ratio of direct to indirect labor. A typical Japanese company today has 2 or 3 times as many middle managers as an American company. This always surprises the participants. There are many takeaways from the study mission that the participants put into practice right away at their companies when they return home. The lesson about smaller spans of supervision and adding layers to the organization chart doesn’t yet seem to be one of those. Going back to the FT article, let’s keep it simple and accept that the strategy of the company should be what determines the organization structure. For a Lean operations strategy you start with the customer who determines the takt time of your business and then you organize all of the activities in your value stream to meet that takt, one at a time. The structure to support this smooth flow will be dictated by the process and work content, the type of problems that arise and need to be solved, and what it takes to support and sustain a Lean system in your particular business environment. 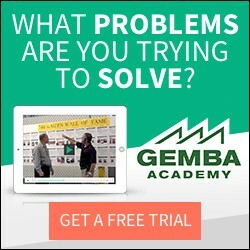 Simply using cost calculation based on ratios of direct to indirect labor is not only harmful but useless since this is disconnected from the realities of the Gemba (actual workplace). Rather than just reducing indirect labor by itself, calculate the cost of losing the gains you made through Lean implementation by not having strong supervision in place. Make the investment in people (just like you would in safety, process capability, or capacity) and train or add supervisors in key places. A lot of things about Lean manufacturing are counter-intuitive to people educated or experienced in manufacturing management. The harder you push, the slower your processes move. One piece at a time is faster than 10 pieces at a time. And now we have to learn that a smaller span of supervision is more effective than a larger span. That’s why they call it continuous improvement. When you remove waste from the shop floor it funds more group leaders / Supervisors / Managers. When you train your leaders to make better decisions and be more effective you save even more. This allows you to have higher levels of staff to workers in Lean Companies than none Lean ones. Most Western Managers take the initial saving and pay them out in dividends. How short sighted are us Western people.